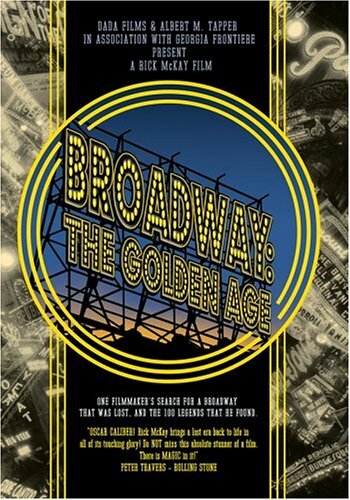 Story: BROADWAY: THE GOLDEN AGE is a labor of love from filmmaker Rick McKay to a bygone era stemming from his own experience of arriving in New York City in the early 1980s and discovering that the Great White Way of his dreams no longer existed. Almost 20 years later, McKay began interviewing the legends of Broadway in order to investigate whether or not the 1930s through the '60s actually constituted a "golden age." McKay interviewed more than 100 performers, composers, and writers over the course of five years with no crew and no budget, just moxie and his digital camera. The result is a compelling walk down memory lane, with anecdotes from the stars and creators of the finest musical and dramatic productions of yesteryear. Among those interviewed are Angela Lansbury, Chita Rivera, Ben Gazzara, Shirley MacLaine, Stephen Sondheim, Hal Prince, Gwen Verdon, Uta Hagen, Bea Arthur, Jerry Orbach, Julie Harris, Robert Goulet, and Elizabeth Ashley. His interviews also result in the rediscovery of some long-forgotten stars. Peppered with clips of original Broadway performances, McKay's film preserves a period in the history of American theater that will likely never be repeated, and that should be celebrated.